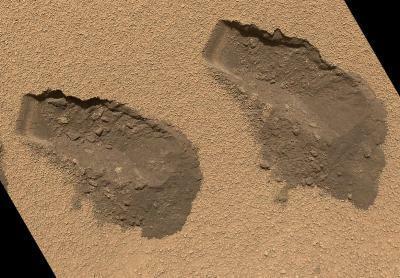 Curiosity Rover: Water For Future Mars Astronauts? NASA's Curiosity Rover has sampled a surprising diversity of soils and sediments along a half-kilometer route during its first few months on Mars. And what it has found tells a complex story about the gradual desiccation of the Red Planet. Perhaps most notable among findings from the ChemCam team is that all of the dust and fine soil contains small amounts of water. In a series of papers covering the rover's top discoveries during its first three months on Mars, the rover's ChemCam instrument team up with an international cadre of scientists affiliated with the CheMin, APXS, and SAM instruments to describe the planet's seemingly once-volcanic and aquatic history. Researchers believed the hydrogen seen in the dust was coming from water, a hypothesis that was later corroborated by Curiosity's SAM instrument, which indicated that all of the soil encountered on Mars contains between 1.5 and 3 percent water. This quantity is enough to explain much of the near-equatorial hydrogen observed beginning in 2001 by Los Alamos's neutron spectrometer on board the Mars Odyssey spacecraft. "We made this discovery literally with the very first laser shot on the Red Planet," said Roger Wiens, leader of the ChemCam instrument team. "Every single time we shot at dust we saw a significant hydrogen peak." ChemCam also showed that the soils consist of two distinct components. In addition to extremely fine-grained particles that seem to be representative of the ubiquitous Martian dust covering the entire planet's surface like the fine film that collects on the undisturbed surfaces of a long-abandoned home, the ChemCam team discovered coarser-grained particles up to one millimeter in size that reflected the composition of local rocks. In essence, ChemCam observed the process of rocks being ground down to soil over time. The ChemCam instrument—which vaporizes material with a high-powered laser and reads the resultant plasma with a spectrometer—has shown a similar composition to fine-grained dust characterized on other parts of the planet during previous Martian missions. ChemCam tested more than 100 targets in a location named Rocknest and found that the dust contained consistent amounts of water regardless of the sampling area. What's more, the Rover dug into the soils at Rocknest to provide scientists with the opportunity to sample the newly unearthed portion over the course of several Martian days. The instrument measured roughly the same tiny concentration of water (about 2 percent) in the surface soils as it did in the freshly uncovered soil, and the newly excavated area did not dry out over time—as would be expected if moist subsurface material were uncovered. The water signature seen by Curiosity in the ubiquitous Martian dust may coincide with the tiny amount of ambient humidity in the planet's arid atmosphere. Multiple observations indicate that the flowing water responsible for shaping and moving the rounded pebbles encountered in the vicinity of the rover landing area has long since been lost to space, though some of it may still exist deep below the surface of the planet at equatorial locations (water ice is known to exist near the surface at the poles). Despite the seemingly small measurements of water in the Martian environment, the findings nevertheless are exciting. "In principle it would be possible for future astronauts to heat the soil to derive water to sustain them," said Wiens. While at Rocknest, scientists were also able to test samples that had been characterized by ChemCam with two other instruments aboard the rover: CheMin, a miniaturized apparatus partially developed at Los Alamos that uses X-rays to determine the composition of materials; and SAM, a tiny oven that melts samples and identifies the composition of gases given off by them. The analyses by all three instruments indicate that Mars likely has a volcanic history that shaped the surface of the planet. A fourth instrument, the Alpha Particle X-ray Spectrometer (APXS), provides additional insights into the volcanic diversity on Mars. APXS analyzed a rock called Jake Matijevic—named in honor of a deceased Jet Propulsion Laboratory Mars engineer—and found that it is one of the most Earth-like rocks yet seen on the Red Planet. The rock's enrichment in sodium, giving it a feldspar-rich mineral content, makes it very similar to some rocks erupted on ocean islands on Earth. ChemCam contributed to the characterization of Jake_M. The Curiosity Rover is scheduled to explore Mars for another year at least. In the coming months, Curiosity will travel to Mount Sharp, a towering peak nearly three miles in elevation. Mount Sharp appears to contain layers of sedimentary history dating back several billion years. These layers are like pages of a book that could teach researchers much about the geologic and climate history of the Red Planet.